UPDATE: Gave up. All the good seats went quickly and I am not going to spend £150 on 2 tickets to sit at the back. We are so excited to be able to tell you that your registration for a chance to buy tickets to see us live in LONDON has been SUCCESSFUL! There have been millions of applications for tickets from ALL over the world, but you can use the special details below to try to buy your tickets! From 10AM MONDAY 1ST OCTOBER, you will be able to use the special link below to have a chance to buy tickets. If you do this before 10PM WEDNESDAY 3RD OCTOBER , you could be able to buy up to 6 tickets to see us live. But hurry, ticket numbers are very limited indeed! Don't forget to keep checking our website http://www.thespicegirls.com/ for updates and more SPICE news. Hopefully we'll see you on tour very soon. Good luck!!! P.S Don't forget ... Tickets are on sale from 10am Monday 1st October so you'll need to be quick to have a chance to get them! Now all I need to do it sit by my computer from 09:58 and keep applying until I get the tickets. With so many people wanting the tickets, I think it is going to be a long day tomorrow. I have Yoga at 12.30 and I plan not to miss it. The Beckhams returned to LA today after spending a few days in London to be by the side of Ted Beckham. Earlier today the England star reportedly spent more than three hours with his 59-year-old father who was said to be "doing well" following life-saving open heart surgery after he suffered a massive coronary last Wednesday. I would have thought David would have left after his dad was out of hospital, but I guess he is doing well enough for him to return to LA. I hope the two men have patched up their differences and begin to heal their relationship fully. You guys know I love the Beckhams, I really do. 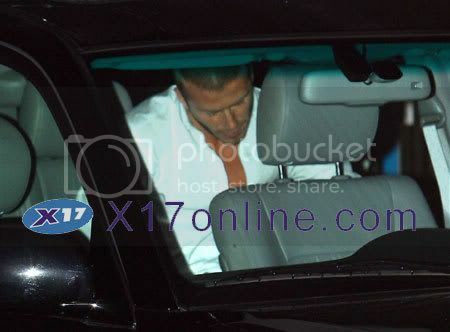 But I must say I was very surprised when I saw these photos of David and Victoria Beckham leaving Nobu restaurant after having dinner their with family in London on Saturday night. The reason I am surprised is because of the choice of restaurant? Both Nobu restaurants have paparazzi camped outside, I know because I have been to both of them. I know Ted is now better, but could they have not dined elsewhere? Victoria looks very tired the poor girl. You can read an article in the News Of The World in which it explains David's guilt over his dad. Victoria Beckham was finally reunited with David in London today. The couple were seen arriving at the London Chest Hospital together at around 11am this morning to visit David’s sick father. The pair spent two-and-a-half hours with the football star's father, who is now said to be "conscious and talking" two days after suffering a heart attack. They eventually left together in David's Bentley. A hospital spokesman said Ted Beckham was still in a stable condition this morning after receiving treatment at the unit. But David's spokesman, Simon Oliviera, added: "Ted is conscious and talking, and that's a positive step." Victoria Beckham arrived at France's Charles de Gaulle Airport at 4am this morning. She then dashed to a waiting private jet at nearby Le Bourget airport to fly to London to be at David's side. Many of you will not know that Victoria and Ted do not get on, and this is one of the reasons David and his father's relationship became strained. You can read all about the fall out and reconciliation in the Daily Mail. David's dad, Ted's condition today is described as stable. David has landed in London this afternoon were he was driven directly to the London Chest Hospital in Bethnal Green, where his father is recovering from surgery. A rep for Beckham released this statement: "His priority is to see his dad and that is his first concern." Victoria Beckham canceled her cosmetic range launch few hours before it was due to start, to fly home to support her husband David. There were a lot of people in her Japanese organization not happy, because she canceled within hours (UPDATE: some are reporting minutes) of the launch as they believed she could still do the launch then catch the next flight to London. I am glad she did cancel. I was really worried that the launch would go ahead. But as always Victoria puts her family first. A tearful David Beckham last night made a dramatic dash back to Britain after his father suffered a a near-fatal heart attack. David was clearly upset as he was photographed arriving at Los Angeles International Airport to catch the evening flight to London. Carrying a small holdall, Beckham, who plays for LA Galaxy, refused to answer questions as he bypassed the check-in desk and headed for airport security. "He was wearing sunglasses but you could tell he had been crying," one eyewitness said. "He had red marks around his eyes and was clearly in a hurry." The dash to London followed the sudden heart attack by Ted Beckham, who "died" on the way to Whipp's Cross hospital in East London and had to be revived by paramedics. David arrived at the LA airport at about 5pm and hurried through the departures terminal. When one reporter told the footballer he was sorry to hear the sad news, Beckham's bodyguard answered: "Show some respect." Beckham rushed straight to airport security without checking in. It was not thought that Victoria would come with him. A hospital source said that as Mr Beckham was being brought in, he "flatlined" - his heart stopped beating - and had to be brought back to life by paramedics. Ted had a tense relationship with the David after he wrote a book in 2005 about David's rise to fame. But earlier this year, the pair were reconciled when David paid a surprise visit to the 1930s terrace house where David grew up and where Ted now lives since his divorce from his wife Sandra in 2002. I wish Ted a speedy recovery, as I am sure you all do. I know I say this a lot, but I really do believe this move to LA is cursed. There is one bad thing after another happening. I hope things settle down for the family soon. 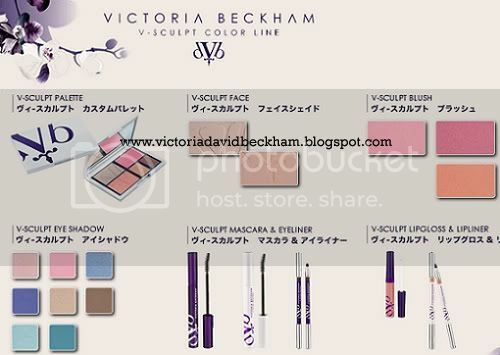 Today we will get to see Victoria's new cosmetic range launched in Tokyo. She filmed this cute (short) commercial inviting fans to join her for her launch. Here is a sneak peek into what we can expect. Blushers, eye-shadows, mascaras, eyeliners, lipgloss and lip-liners, all with the dvb logo. I love the colours in this collection, as I see Victoria Beckham wearing them. There is nothing I hate more than a celebrity not "buying what they are selling"...if you catch my drift. These promo photos were obvious shot pre-blonde, pre-move to LA. It is late here in London (00:29, 8.29 in Tokyo) so hopefully by the time I wake up there will be launch photos for me to post. Check back later. Sorry about the stamps over the pictures. You would be surprise how many Victoria Beckham "fan sites" try to pull my stuff off as their own. The new fragrance, Intimately Beckham, developed by Victoria and David Beckham, has been selling very well in the US after only two weeks, according to Coty Beauty, so discard the Ebay rumours of poor sales. (this is why I don't post like to post rumours). Sales of the fragrance are among the top 10 in their accounts. Not that they are competing, but the "for her" developed by Victoria Beckham is outselling "for him" by David Beckham, at a rate of two to one. Oh....David must be so jealous. We get it...we get it..you are both hot. David Beckham went out with his team mates to Hollywood hotspot Hyde last night. According to X17 Online it's the crime of the century. They are trying to assume that "While the cat is away, the mice will play", which is total bull crap. Is the man not entitled to live his life? Since his injury we have hardly seen him out. This night out was most likely a team bonding exercise or a congratulations on their recent win. Why do people always assume the worst? Who Wore Hervé Léger Better?